1. What year did you graduate from The University of Texas Health Science Center at San Antonio? 2. What is your specialty? 3. What was the most valuable lesson – inside or outside the classroom – you learned at UT Health San Antonio? The experience I had as a third-year medical student was invaluable. I learned the depth of fear, uncertainty, and insecurity as I assessed a patient for the first time. The patient and I shared in these rudimentary emotions, as we engaged in the vulnerability of the healing process. These patient care experiences, during the infancy of my training, provided sustainable grounding for my development as a clinician. 4. What inspired you to want to become a doctor? I've wanted to be a doctor after a series of personal experiences over the past 20 years, including witnessing my mother's struggle with breast cancer, my personal difficulties managing traumatic brain injury and brain surgery, mentorship from community physicians, and involvement in underserved, global health clinical experiences. 5. What do you remember most vividly about your time at UT Health? I remember the devoted faculty and staff who have spent their careers training physicians. I'll forever be grateful to have learned from these brilliant and compassionate people. 6. What was your most rewarding experience at the university? In 2012 and 2014, I spent time in Guatemala through the Center for Medical Humanities and Ethics at UT Health San Antonio. These global health experiences encouraged me to consider population health, and strengthened my passion in addressing health disparities. 2014 Directed and produced documentary film “Image of the Enemy” shot on location in the Palestinian Territories in West Bank, Israel, the Middle East. 8. What is your current occupation and where? What’s a day on the job like for you? I'm currently a third-year, senior resident physician with CHRISTUS Santa Rosa Family Medicine Residency Program. We are a community-based residency program aimed at training family medicine physicians interested in full-spectrum training. As a third-year resident, I periodically serve as the leader of our inpatient hospital service where I oversee a team of junior residents and interns. We manage critically-ill patients in our intensive care unit, manage our patients on the medical and surgical floors, triage and deliver laboring mothers, manage newborn care, and fulfill our roles at our outpatient continuity clinic. As residents, we also serve on hospital committees, and perform quality improvement research. I've accepted a Post-Doctoral Fellowship Position with Yale University through the National Clinician Scholars Program (NCSP). The NCSP at Yale is an interprofessional fellowship program designed to prepare a select group of future clinician leaders to improve health and health care in the U.S. through scholarship and action at the national, state, and local levels. I will begin my post-doctoral fellowship with Yale in the summer of 2018. 9. What advice do you have for current students? Every day, I wake up and reflect on how much I have to learn. I work relentlessly to improve that condition daily. I encourage others to do the same. Serve others in all you do, and seek truth, beauty, wisdom, and justice in all things. 10. Why do you give back to the university (time and/or donation)? I'm devoted to serving the human condition for the rest of my career. 1. What is your anticipated graduation date from UT Health San Antonio? 2. As a student, which specialty(ies) interest you most? I am particularly interested in Dermatology – a field I have been interested in for the past six years. At the same time, I really enjoyed learning about Gastroenterology, Pediatrics, and Internal Medicine. However, like most medical students, I am keeping my options open. After all, a great doctor – regardless of the field he or she pursues - is the one who enjoys all courses and strives to learn the most in school. 3. 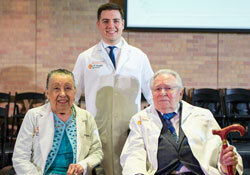 What has been the most valuable lesson – inside or outside the classroom – you have learned at UT Health? The most valuable lesson I learned at UT Health is that if there is a will, there is a way. The best part about our institution is that the administration is extremely supportive of its students. 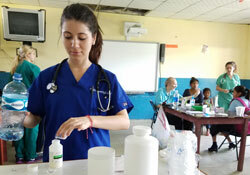 I would have never thought that I would have the chance to participate in a global health experience in Panama, present multiple posters in a variety of conferences, and attend trainings that would make me a more skilled medical provider. These experiences were all free of cost due to the generosity of donors who have invested in providing support for medical students. Furthermore, I have encountered tremendous help and guidance when it comes to making my short-term goals a reality. Whether it is obtaining funding to provide a lean six sigma training session for students or receiving support to renovate the Travis Park dermatology student run free clinic or having the chance to partake in a research elective in our nation’s capital, this institution has provided invaluable understanding, compassion, and guidance. It has presented me with countless opportunities to meet incredible alumni; to get to know world-renowned experts who practice in San Antonio; to become involved with the Bexar County Medical Society, the Texas Medical Association, and the American Medical Association; to shadow phenomenal physicians; to learn from exceptional researchers who are involved in ground-breaking research; and much more. 4. What inspired you to want to become a health care professional? I decided to pursue medicine out of pure interest in the field. While growing up, I used to accompany my grandmother at the hospital in which she served as the head nurse for 40 years. My grandmother was a great role model when it came to achieving her goals while also caring for her family. She taught me how to use a stethoscope, how to take a manual reading of a patient’s blood pressure, and how to ensure that my white coat – a little white shirt she had turned into a white coat for me – would always be sharply ironed and clean. She allowed me to be “her attending” while she was my right hand and took care of the nursing aspect of hospital work. The care she provided to the people in our town and the professionalism she demonstrated to her superiors on a day-to-day basis were inspirational. I grew attached to the hospital environment she exposed me to. Upon moving to the U.S. from Bulgaria in 2004, I persisted with my dream of working in a health care setting, and I did absolutely everything I could to ensure that I was on the right path toward achieving my goals. I attended Health Careers High School, which affirmed my passion for medicine, and I was accepted into the combined B.S./M.D. program at UTSA and UT Health SA. Today, I could not be happier about the decision I made to stay in San Antonio for college and to attend the Long School of Medicine for my professional training. 5. What has been your most rewarding experience at the university thus far? I have had so many rewarding experiences at the university, for which I am extremely thankful for. This past semester, I was able to co-author a proposal for funding that would open the possibility for medical students to obtain a yellow belt certification in lean six sigma. We received $20,000 and were able to provide 40 students with certifications in an area in which medicine and health care are heading. Lean six sigma is a way in which companies and corporations can reduce costs, eliminate wasteful practices, and improve their process of workflow to achieve better results when it comes to their professional and economic performance. It was not until several weeks after the training took place that we realized how big of a “deal” this was. There is so much potential for students to explore in this field and to learn invaluable lessons about the way the health care system is structured and works. The next step of the idea would be to obtain further training, and I am forever thankful that the school is allowing us to pursue such avenues. 6. What advice do you have for incoming students? Be persistent with your ideas, goals, and dreams. There might be times when what you want to realize seems impossible or too challenging, but giving up is the only action that will certainly hinder the realization of your goals. Persistence and grit are the most valuable tools one can have to see his or her goals to fruition. 7. How do you intend to give back and pay it forward for future students? I intend to give back by being involved with the university as much as I can. I would love to stay in San Antonio and practice medicine in the community that taught me so much about compassion, care, and service. I love teaching, so pursuing academic medicine is one option. In addition, given my long-term involvement in volunteering in student-run free clinics, I would love to continue fostering my professional skills while proving care for the underprivileged and uninsured. Last but not least, I have been extremely fortunate to have been guided by incredible mentors from which I have received advice about school, extracurricular activities, work opportunities, and even life. My mentors are life-long lifelines who have been there for me in some of the most challenging parts of school and who have been able to help me get up after a fall, shake myself off, and move onto something better. They have inspired me to strive to be just like them, and so I have been involved with mentoring since my undergraduate years. As a Peer Mentor for UTSA freshmen and as a FAME mentor for younger students in the B.S./M.D. program, I sincerely enjoy talking to aspiring professionals about their goals. When possible, I would always be available to those who want to talk to someone who has walked the path they are on.